While diagnosing abdominal adhesions, it is important to take a thorough clinical history in order to substantiate suspicions. This is crucial because a confident diagnosis will not be obtained by any other means, except intraoperatively. Adhesions may occur anywhere in the body, but are most commonly found in the gastrointestinal tract, heart, and pelvis. Tissue injury due to surgery, trauma, infection, or radiation triggers cells in the body such as macrophages and fibroblasts to begin the process of healing. This process results in the formation of bands of scar tissue or adhesions, which create an interface between tissues that are not usually joined together. While these adhesions themselves are painless, they generate adhesion-related complications that can cause pain and obstruction, which, in some instances, can be potentially life threatening. The diagnosis of Abdominal Adhesions is typically done with the assistance of laparoscopy. This procedure involves using a camera to visualize the organs within the abdominal cavity. Routine tests such as X-rays, CT scans, and blood work are useless in diagnosing the adhesion itself. However, they are great choices in identifying adhesion-related complications like bowel obstruction, which restricts the movement of food, fluid, stool, and intestinal gases. 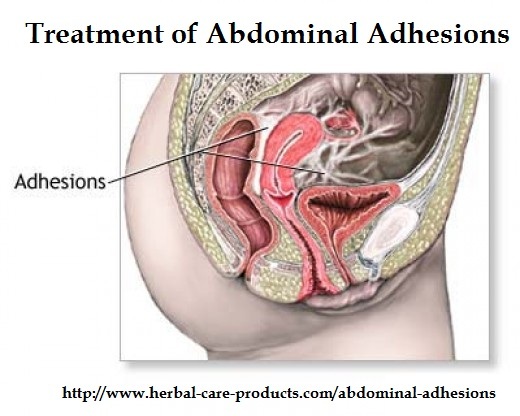 Treating an abdominal adhesion depends widely on the adhesion-related problems, the location of the adhesion and the extent to which it is formed. There are two primary surgical techniques used to treat abdominal adhesions: laparotomy and laparoscopy. In laparoscopy, a small incision is made and with the help of the camera adhesions are cut and released. This technique is known as adhesiolysis and is done under general anesthesia. It is indicated in patients who present with obstruction of the small bowel and no signs of inflammation of the peritoneum, hemodynamic instability, or bowel ischemia or perforation. In laparotomy, a larger incision is made to directly see the adhesions and treat them. This technique is also known as open adhesiolysis and is associated with potential complications such as acute renal failure, sepsis, myocardial infarctions, respiratory failure, and wound infections. Moreover, the paradoxical relationship between treating adhesions surgically and surgery as the most common cause of adhesions makes the Treatment of Abdominal Adhesions particularly difficult to manage. Preventing abdominal adhesions is not an easy feat. However, surgical techniques can effectively minimize the occurrence of abdominal adhesions. Laparoscopic surgery is great, because the incisions are smaller than that of laparotomy. If, for whatever reasons, laparoscopic surgery cannot be done, and open adhesiolysis is required, a wax-like film is placed between the organs and the incisional area to help prevent the formation of new adhesions. The film is absorbed by the body within a week and it hydrates the organs in the process. This prevents dehydration, a strongly suspected cause of adhesion formation. There have not been any studies published to support nutrition or diet as protective or causative factors in the development of abdominal adhesions. However, other steps that may be taken during surgery to reduce incidence are minimizing surgery time and intermittently moistening incisional area with saline, swabs, and drapes. Furthermore, latex- and starch-free gloves as well as the gentle handling of organs and tissues have shown promising results in terms of reducing the chances of developing post-operative abdominal adhesions.